The most spread out and the largest nomadic tribe in the world. From the shores of Senegambia to the banks of the Nile and the Red Sea. Fulani is one of the largest tribes of Africa numbering more than 50 Million and spread across the band of the Sahel from Senegal to Eritrea. They are called by different names depending on the language: Fulani, Fula, Peul, Pul, Fut, Fellata, Tekruri, Toucouleur, Peulh, Wasolonka, Kourte, etc. but they refer to themselves as Pullo (singular) and Fulbhe (plural). They are traditionally a nomadic people but after embracing Islam, they began living a more sedentary lifestyle. They are physically characterized by their lighter or reddish skin, thin nose and lips and usually have a tall and thin stature. 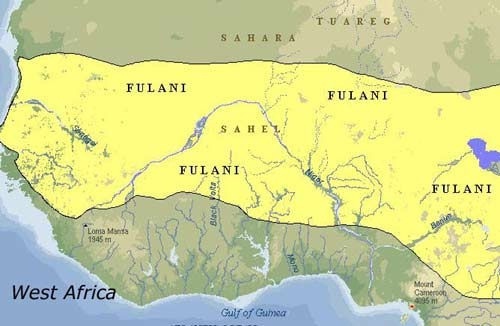 They founded several empires across much of West Africa including the ancient Tekrur and more recently the vast Sokoto Empire that extended from Mali to Cameroon and included all of the northern part of Nigeria and Cameroon. In their quest for greener grass and for the purpose of spreading Islam, they conquered many smaller kingdoms on the ashes of which they founded many powerful but smaller states. The kingdom of Fuuta Jallon in Guinea is an example. Today, they live a more sedentary lifestyle and are involved in many other activities including trade and agriculture. Their origins have been subject to much speculation but the most widely accepted source attributes their origins to ancient Egypt were they lived thousand years ago before migrating West and South and then East in search of greener pasture for their cattle. Fulani are the most widespread ethnic group in Africa and they can be seen in all major cities of Sub Saharan Africa and the Western world. They are excellent traders and business people. Copyright 2012 Winden Jangen ADLaM. All rights reserved.